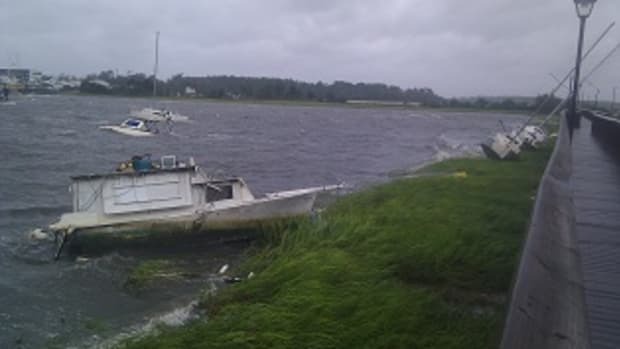 Despite its downgrade to a Category 2 hurricane, Irene is still bearing down on the East Coast along its projected path, forcing boaters to frantically step up their efforts to secure or haul their vessels. "The weather models have not changed," tropical weather expert Rick Knabb says on the Weather Channel website. "I don&apos;t have any good news for you here. I don&apos;t have any weather models shifting offshore. It&apos;s just not going to happen, no matter what track it takes." Irene is predicted to hit North Carolina late tonight through Saturday. The Mid-Atlantic and Northeast would be affected Saturday night through early Monday, meteorologists say. "We&apos;ve got mass confusion here," says Lee Sykes, franchise owner of TowBoatUS Oregon Inlet (N.C.). 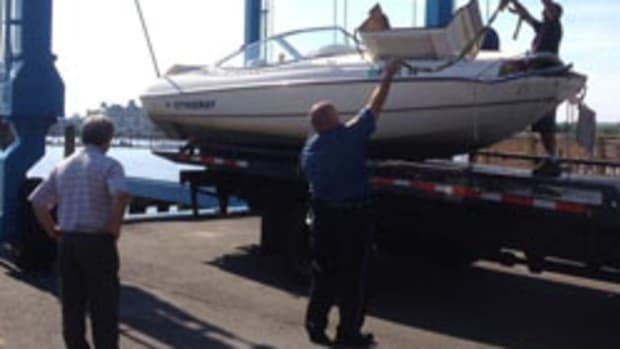 "[Boaters] are running out of fuel. They&apos;re overheating their engines, pushing too hard to get somewhere. I had a sailboat 15 miles offshore that lost engine power. He was running from the storm to Key West. We had to go get him." Click play to watch a time-lapse video of boats being hauled out at the Coast Guard Academy in New London, Conn. The marina in Oregon Inlet has been hauling boats for the last three days, 24 hours a day, Sykes says. And his boats have been towing vessels from about 5 a.m. till after midnight each night, he says. "The boating community here is most concerned about rising water levels," he says. "The winds are certainly a factor, but we&apos;re worried about storm surge." Conditions in the lower Chesapeake Bay were "eerily calm," TowBoatUS Virginia Beach Capt. Byron Farlow said from his 35-foot towboat at about 10:30 a.m. this morning "It&apos;s like a mill pond out here right now," he says. "You can see the outer bands of clouds, though." Farlow says boaters and waterfront business owners and residents have been doing a good job preparing for Irene. "They&apos;re heeding this warning," he says. "I see a lot of boarding up going on." 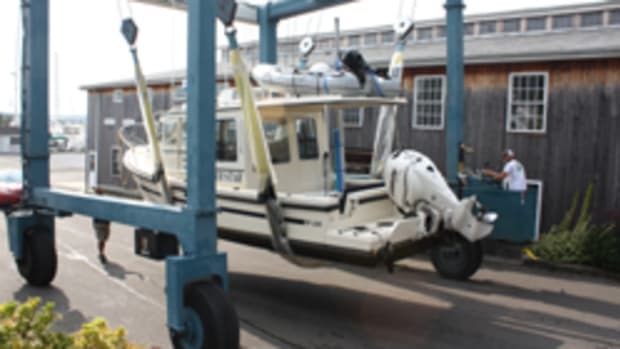 In Cape May, N.J., the last day of a popular sportfishing tournament, the Mid-Atlantic $500,000, was canceled, causing mayhem in the harbor, says Sea Tow franchise (Sea Isle/Cape May) owner Capt. Jack Moran. "At 5 o&apos;clock this morning the harbor was absolutely full of boats," Moran says. "I haven&apos;t seen it that busy in a long time. Because we had the tournament this week we had 118 sportfishing boats here from all over the country. Everybody is heading for different ports. It was crazy." There are still a lot of boats in the water, which concerns Moran. "It&apos;s a 500-mile-wide storm, and we&apos;re going to feel some impact," he says. "I was in Naples, Fla., for Hurricane Wilma, a Cat 3 storm, and any boat in the water was pretty much destroyed. If it&apos;s a Cat 2 or Cat 3 it&apos;s going to be pretty devastating here. We&apos;ve got some pretty big boats that are still in the water. If one of them breaks loose, look out." The hurricane&apos;s characteristics this morning indicated that there was nothing to knock it off its current predicted path, Knabb says. "Because it is so large and staying near the ocean it is not going to weaken very quickly, and we could have a hurricane going all the way up to New England," he says. 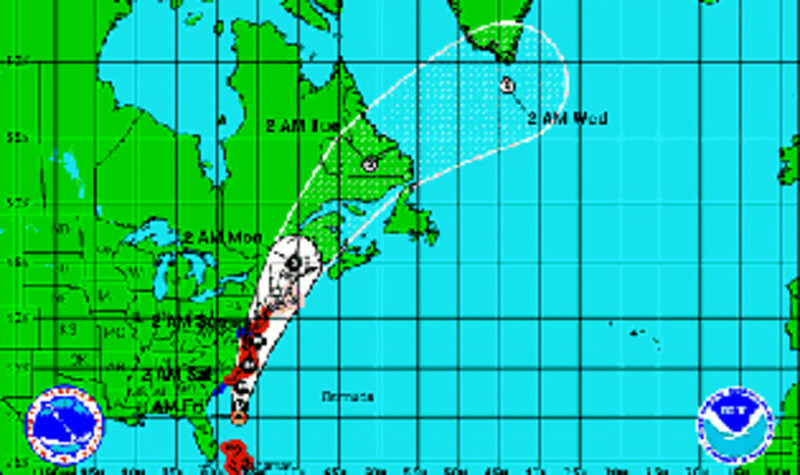 Click here to track the storm’s progress up the East Coast.